Look and listen very carefully to these experts Even if their techniques don't work for your style of competitive shooting the thought processes are very interesting. An excellent training aid. Excellent 3-way presentation on advanced techniques which I converted to timed and recorded drill sheets that can shave seconds off a stage. Hier gibt es 3 verschiedene Top-Meinungen zu den Grundtechniken im IPSC-Schießen. Schön erklärt und gut nachvollziehbar, man kann die beste Methode für sich selber heraussuchen. Ihr solltet euch mal die Master-Class-Series anschauen, als Training-DVDs unschlagbar gut. Habe mir dann die 3GM-Serie dazu gekauft und nichts davon bereut. Klasse! I have both 3GM and 3GM2, when can I have 3GM3? Can't wait cuz this is a very good coaching DVD! Well done DAA! As beginner starting out in ISPC. This an excellent training material to allow me to work on the basics. Good clear explanation with different of points of view on how to approach each of the basics. Had this DVD for over 2 weeks now and i keep going back to it over and over again. It deals with mainly with core skills such as reloads, draw and moving between shooting positions. The quality of instruction is excellent, very clear and concise. The format of having three very experienced shooters giving you their own ideas on each subject is very interesting, as you can see both similarities and differences. I feel i have already learnt a lot from this and will continue to do so. Highly recommended. 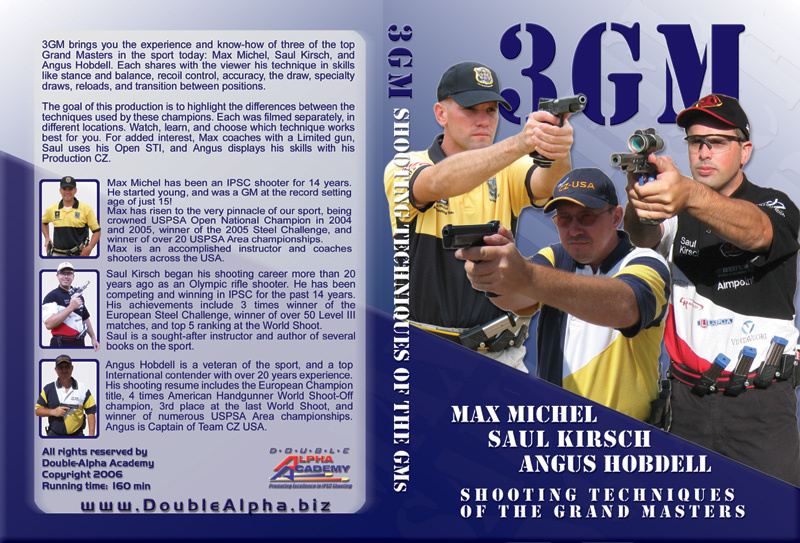 3GM brings you the experience and know-how of three of the top Grand Masters in the sport today: Max Michel, Saul Kirsch, and Angus Hobdell. Each shares with the viewer his technique in topics like stance and balance, recoil control, accuracy, the draw, specialty draws, reloads, and transition between positions. The goal of this production is to highlight the differences between the techniques used by these champions. Each was filmed separately, in different locations. Watch, learn, and choose which technique works best for you. For added interest, Max coaches with a Limited gun, Saul uses his Open STI, and Angus displays his skills with his Production CZ. Max Michel has been an IPSC shooter for 14 years. He started young, and was a GM at the record setting age of just 15! Max has risen to the very pinnacle of our sport, being crowned USPSA Open Nationals Champion in 2004 and 2005, winner of the 2005 Steel Challenge, and winner of over 20 USPSA Area championships. Max is an accomplished instructor and coaches shooters across the USA. Angus Hobdell is a veteran of the sport, and a top International contender with over 20 years experience. His shooting resume includes the European Champion title, 4 times American Handgunner World Shoot-Off champion, 3rd place at the last World Shoot, and winner of numerous USPSA Area championships. Angus is Captain of Team CZ USA. Saul Kirsch began his shooting career more than 20 years ago as an Olympic rifle shooter. He has been competing and winning in IPSC for the past 10 years. His achievements include 3 times winner of the European Steel Challenge, winner of over 50 Level III matches, and top 5 ranking at the World Shoot. Saul is a sought-after instructor and author of several books on the sport. 3GM is a double-disc production, running approx. 3 hours.